Peterborough United manager Grant McCann has issued a ‘hands off’ notice regarding striker Paul Taylor. Taylor is understood to have been the subject of multiple bids from League Two side Mansfield Town, but McCann insists the 29-year-old is going nowhere. 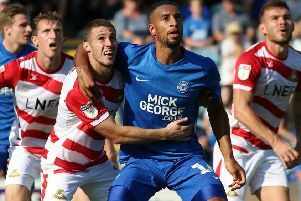 Is Michael Bostwick set for a return to the Posh midfield? Stags boss Steve Evans has taken right-back Hayden White and striker Shaquile Coulthirst on loan from Posh in recent days. He is understood to have bid up to £200,000 for Taylor who is out of contract at the end of the season. Evans has hinted he is chasing a third signing from Posh. “Paul Taylor is going nowhere,” McCann stated, “He will be with us for the rest of the season at least. “We took a chance on Paul when no else wanted him in the summer, but all off a sudden he’s a person of interest. Harry Anderson is currently on the Posh injury list. “He’s really turned his life around. He has two young boys so he’s settled at home. The lads love him as a player and a person and he comes in every day and trains hard. Taylor, who has scored five goals this season, might not start tomorrow’s (January 21) League One game at Swindon. Marcus Maddison is set to return to the starting line-up after impressing as a half-time substitute in last weekend’s disastrous 5-1 hammering at Bury and McCann admitted at a fans’ forum earlier this week he finds it hard to get Maddison and Taylor in the same team. Central defender Dominic Ball has recovered from a shoulder injury and should be in a matchday squad for the first time. If he starts it could free Micheal Bostwick up for a return to midfield. “We’re looking forward to this game,” McCaann added. “It’s always a nice pitch, and it’s a big pitch which will suit the way we play, but Swindon will also be confident going into the game after their excellent win at Bolton last weekend. “It will be a good footballing match and hopefully we will come out on the right end of the result. We need a win. We have forgotten last week’s result already when we just suffered a bad day at the office and we are focused solely on getting back to winning ways at Swindon. Posh remain committed to bringing in a new striker before the end of the January transfer window. McCann revealed he had plans for Harry Anderson to act as right back cover for Michael Smith until the teenager suffered a knee injury.